Mauricio Pochettino revealed he was "nearly crying" due to the emotion of being present at the long-awaited opening of the new Tottenham Hotspur Stadium. 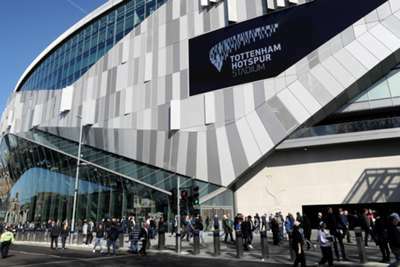 Spurs were due to move into the redeveloped White Hart Lane in August but the project suffered repeated delays. However, Tottenham Hotspur Stadium finally played host to its first test event on Sunday, an Under-18 fixture between Spurs and Southampton. And an emotional Pochettino feels chairman Daniel Levy deserves credit for pushing the project forward. "It's unbelievable, it is so difficult to explain, only with a few words. We all feel the same. It's so exciting," Pochettino told Spurs TV on the pitch at half-time. "I got the same feeling on the last day when we left White Hart Lane. We were crying and now the first day, here at the new stadium, the same emotion. We are nearly crying. "Our dream becomes true and first of all we have to say thank you to Daniel Levy, because in 2001 when he started to believe in that dream he made it possible for everyone to be here today and he deserves big applause – and all the board." Pochettino praised the patience of the club's fans, who continued to travel to watch the team play at Wembley while the stadium works were completed. And he feels the opening of the new venue could give Spurs the edge in next month's Champions League quarter-final against Manchester City. "It's going to be amazing and a massive impact for the team, for the players and the club to have the possibility to finish this season [at the stadium]," added Pochettino. "In the Premier League we are in a good place and of course we have a massive challenge in the quarter-final of the Champions League. "But I think with all our fans, 62,000 people behind us it's going to be fantastic to play and we can make possible our dream to play in the semi-finals. "It's our new house but we're going to create a new home and that is different. White Hart Lane was magic but I feel that this new stadium is the best in the world. "When it starts to feel like home it is going to be really unbelievable. I really believe that the future of the club is going to be fantastic." The honour of scoring the first goal at the stadium went to J'Neil Bennett, who cut in from the left wing before bending a fine finish into the bottom-right corner. Harvey White doubled the Tottenham lead from the penalty spot before half-time and, after Kornelius Hansen pulled one back for Southampton, Dilan Markanday sealed a 3-1 victory on a historic day for Spurs. Tottenham's first Premier League game in their new home will be against Crystal Palace on April 3.